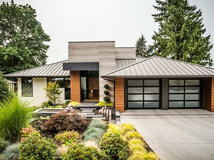 Houzzers, I’ve never really shared my own home with you before, and I’m a little nervous. 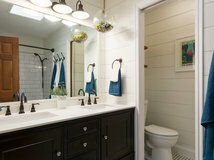 But I learned so much from my recently completed bathroom renovation that I wanted to tell you about it. 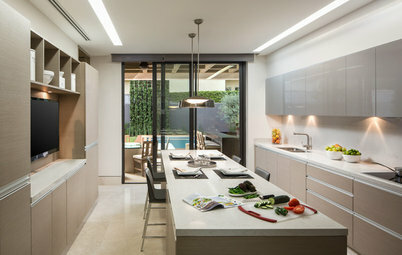 The project started out as a fairly light makeover but blew up quickly as it evolved. I am not an interior designer, but the wealth of information and inspiration I’ve gleaned from interviewing hundreds of them over the years was a big help throughout the process. 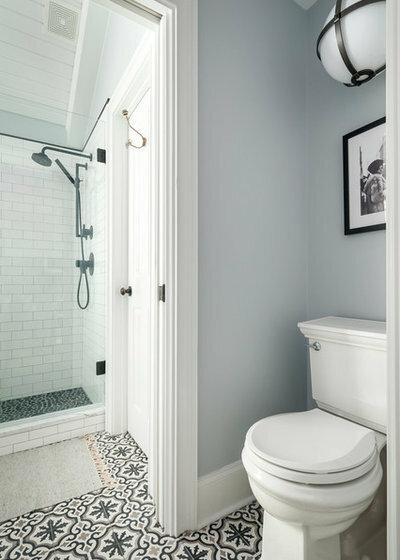 It all began with this grungy shower stall. I dreaded showering in here. First of all, it was tiled in travertine. Not super-pretty vein-cut travertine but just yucko builder’s-special travertine that was popular in the late 1990s and early 2000s. No matter how well it was sealed and scrubbed and resealed over the years (an expensive process), it was porous and a magnet for mold. And then there was no cleaner I could use to get the reddish iron marks from Atlanta’s water out of the grout without removing the sealant. 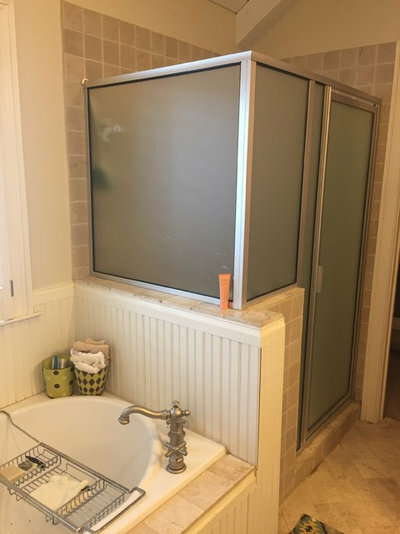 A built-in (moldy) bench made the shower feel cramped. The dated framed translucent glass surround never felt clean and made it feel even more cramped and dark. And there was just no way to get some of the grunge out of that frame. I should mention here that I did not receive any discounts or special treatment in exchange for this story. But my brother owns the construction company that completed the renovation, and he passed along his friends-and-family trade discount perks at a few vendors. He also stayed far away from being involved in my project. I can’t imagine why. What I learned: Wow, you really don’t see your own clutter until you take a photo of it. (Or is that just me?) I also learned that it can be hard to take a good, well-lit “before” photo. This one is dark even though all the lights are on and the blinds are open. Hey, at least my toilet seat is down. 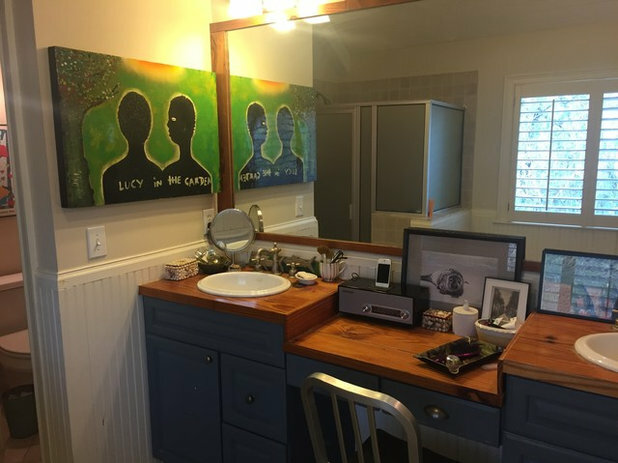 I really liked this vanity, and I wanted to try to preserve the countertops. They were made of reclaimed pine boards from my attic floor and were about 80 years old. (That’s a good trick to know, by the way. 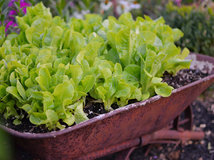 An older home’s attic floorboards are a great source of reclaimed lumber.) The mirror frame is made of the same wood. 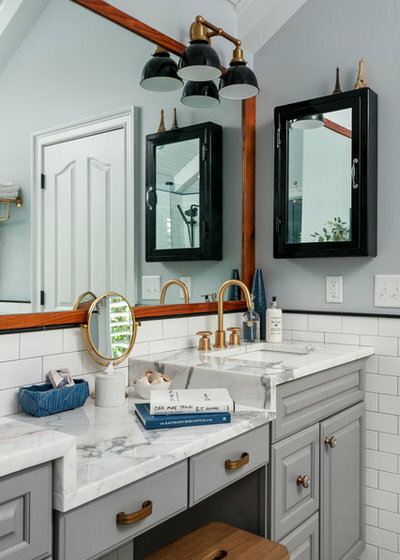 Although I knew that tiling the wall and placing mirrors atop it would be a more updated look, I loved having this huge mirror and decided to keep it. It bounces so much light around and makes it easy to get ready in here and check my hair and makeup. I used to have beadboard wainscoting around the room. I never realized that it was uneven on both sides of this door until I saw this photo. But what I had noticed was that dust and grime would collect in the grooves of the paneling and be hard to get out. 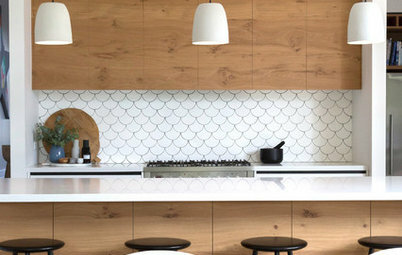 The inspiration: Once I found this tile, most of my plans revolved around it. Warm gray, light blue-gray, charcoal gray, black and white, and powdery blue came into play in my color palette. The meeting: So on day one of the construction process, several of us crammed into my bathroom. My brother, Clark Harris; his second-in-command, Eric Bain; my project’s day-to-day manager, Junior Zenil; and Clark’s amazing office manager, Aisling Bell. They looked at what would be changing and approximated the schedule. Eric, whom I know pretty well and know to be fairly fiscally conservative and often a man of few words, kept looking at me and saying, “Radiant heat would feel really nice.” I mean, if Eric was in favor of heated floors, that was powerful. As they looked at the adjacent closet, which was carpeted, they suggested extending the heated tile floors in there as well. Now the closet became part of the project, just like that, and I was going to go for heated floors. The radiant heat portion added about $1,500 to the budget. And I can’t wait for it to get cold outside. What I learned: Be prepared for a mistake. One thing my brother said to me as he very officially went over everything we were going to do was, “I tell all my clients that there is probably going to be a big mistake made along the line. Just know that when it happens, we will fix it, and it will be fine.” I thought this was a very smart thing to say. Also, the morning after a mistake did happen, Eric brought me an Egg McMuffin and a regular Coke, the first one I’d had in many years. And the team fixed it that day. 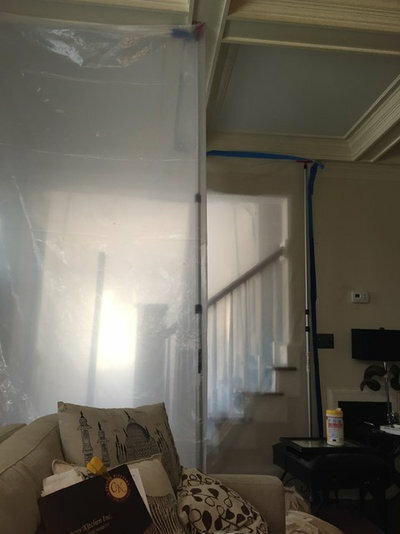 What I learned: Living at home through a renovation will make you feel like John Travolta in The Boy in the Plastic Bubble. They prepped by laying down cardboard over my floors along the path from the front door to the bathroom and creating a plastic tunnel that led upstairs from the front door to keep the house from filling with dust. Zipping and unzipping plastic doors to get to certain places in my house became the norm. They also vacuumed and swept their way out the door each day. Ask your contractor if the team does this when you’re getting your estimate. Also make sure items like the dumpster and the port-a-potty are included, along with their servicing. You’ll find that unrealistic low-ball offers leave out necessary line items like this. What I learned: Demo day is crazy. It was good to get out of the house to shop for faucets and fixtures because the noise from demolition was unreal. Earplugs were fine while I was writing stories, but I don’t know how I thought I could attempt phone interviews with Houzz pros while this was going on. I had planned to make the calls from my porch, not remembering that my porch is just below my bathroom and it was even louder out there. What I learned: While you have a dumpster in your driveway, make good use of it. 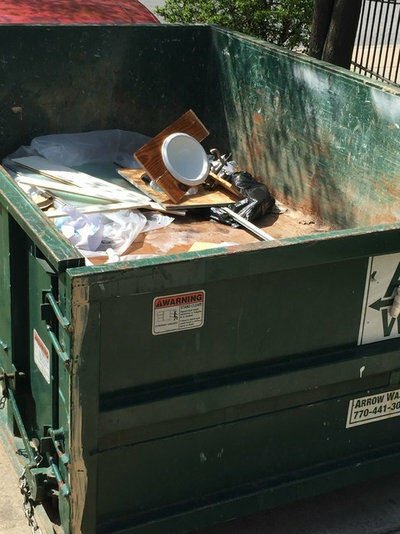 Although I did not go full-on Marie Kondo, I completed a major purge, donating and recycling whatever I could along the way, but throwing a few things that were no good for anyone into the dumpster. It felt great to get rid of so much. When I was done, I also had 15 lawn bags full of stuff for two charities that picked up the donations on my doorstep. Both of these charities send email alerts about once a month with dates they’ll be in the neighborhood. Ever since the big purge, I keep a donation bin going and try to sign up every time, knowing that it will spur me to clean out another closet or cabinet by the deadline. What I learned: I am not much of a techie, but project management software was helpful. Innovative Construction set me up with an app, which was a great tool for all of us to communicate. I could keep up with the schedule, invoices, paint colors, lighting choices, work order changes and everything else right from my phone. What I also learned: I never realized how bad my kitchen island top looked until I took this photo. You can see the quartz I replaced it with during construction in this photo of my kitchen. Also, that wine opener was perhaps the most important tool involved during the process. 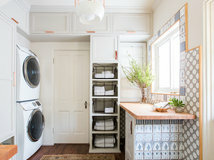 Aisling provided me with a thorough checklist of what I’d need to procure for my project, with vendor and showroom suggestions and other tips on the app. What I learned: Sometimes the highway falls down! Around day six, the portion of Interstate 85 where I usually hop off and on caught fire and collapsed, which put a crimp in my plans for running around Atlanta looking for tile and faucets and lighting. I was able to check out a lot online before braving the crazy traffic to hit the showrooms and walk to stores. What I learned: I saw the true power of the traffic-navigation app Waze. I also learned to order things way ahead of time. Almost everything I ordered was on back order, double back order, triple back order or we-have-no-idea-if-it-will-ever-be-ready back order — or it was made-to-order, broke on the way to the store, got lost within the store once it arrived intact or is still missing in action and untrackable. There is still one toilet for the downstairs bath I was going to have installed while I had a plumber in the house that surely must have taken a route via Timbuktu. Had I been less picky and ordered way ahead of time, the renovation would have taken about five weeks. Due in large part to a chandelier I simply had to have, the job ran from April 1 to mid-July, though the bulk of it was done in two months. This was solely due to my back-order curse. What else I learned: Some things are worth the splurge. On a stroll over to Ponce City Market, I fell in love with this faucet. 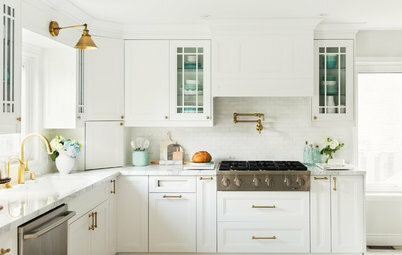 Its handles remind me of old-fashioned sprinklers, and the aged brass finish was perfection. They were out of my budget, and I needed two sets. 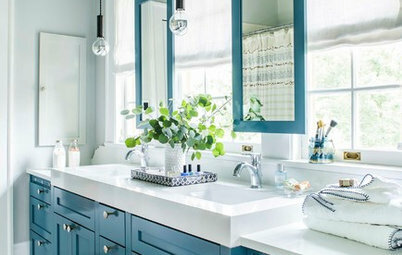 To balance out this expense, I went with inexpensive sinks from Custom Kitchens, the place that furnished my countertops, and they are just as nice as the more expensive options I had browsed. What I learned: Be flexible and find a great associate at showrooms to help you. 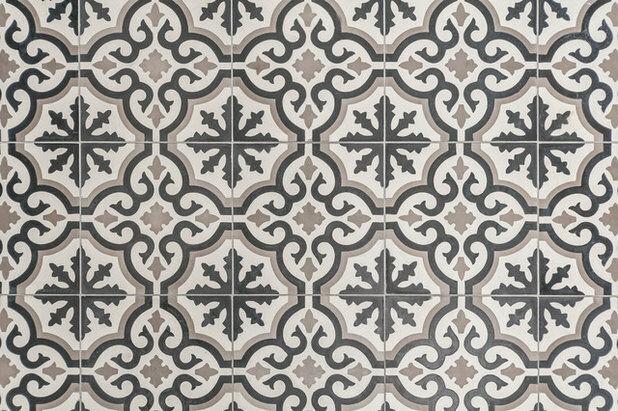 I was really set on all antique brass, but I also knew that I wanted some graphic black and white in the bathroom. 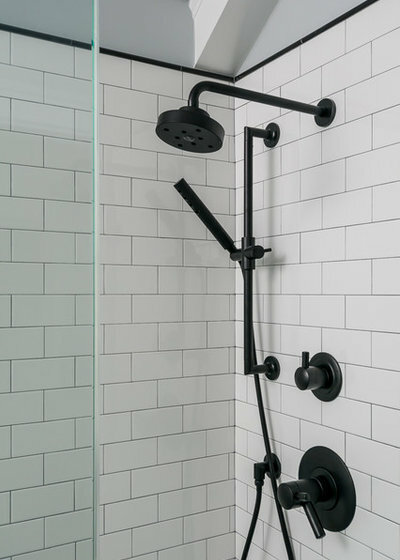 Beth Moon at Plumbing Distributors, or PDI, was instrumental in the decision to mix in matte black fixtures by Jason Wu for Brizo in the shower. I also learned to always use the restroom at a bathroom showroom; PDI has a luxury toilet that does everything except hand you toilet paper, and it is quite an experience. What I learned: In your initial meeting, ask the plumber which brands he or she loves to work with. 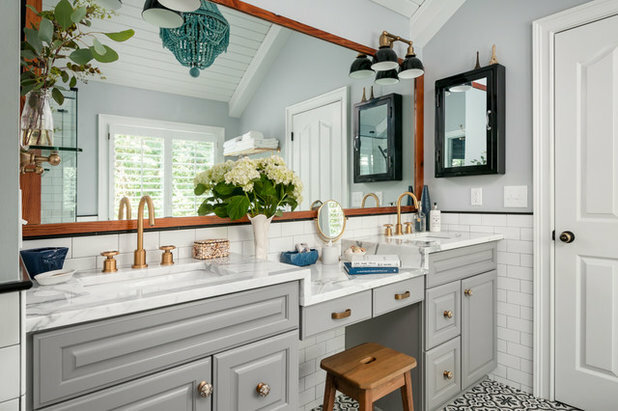 They will have good insights about which fixtures they install with ease, which may have the rough-ins ready and which will have replacement parts readily available if you need a repair down the line. 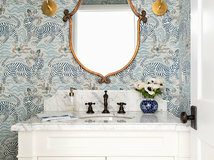 It can help inform your decisions when you are shopping for fixtures. 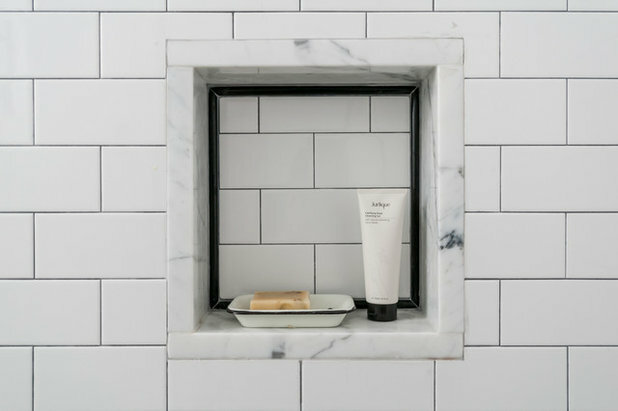 Shower tile: I have loved classic subway tile since long before it became so popular. It will never go out of style for me personally. I went for a medium gray grout because of the aforementioned reddish staining that comes with Atlanta’s water. It’s easier to keep looking clean. 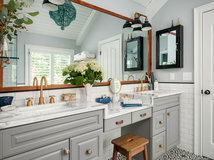 And after writing “pebble tile feels wonderful underfoot” so many times for Houzz, I wanted my feet to feel wonderful too, so I found a reasonably priced granite pebble tile at Floor & Decor. 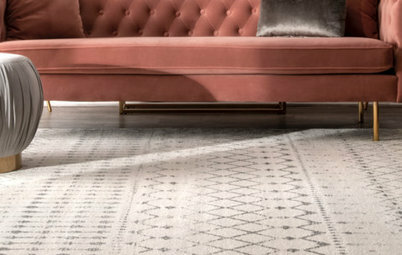 What I learned: Pebble tile feels wonderful underfoot. Also, I learned the hard way to make sure the grout is totally dry before you try to feel how wonderful the pebble tiles feel underfoot. Whoops. 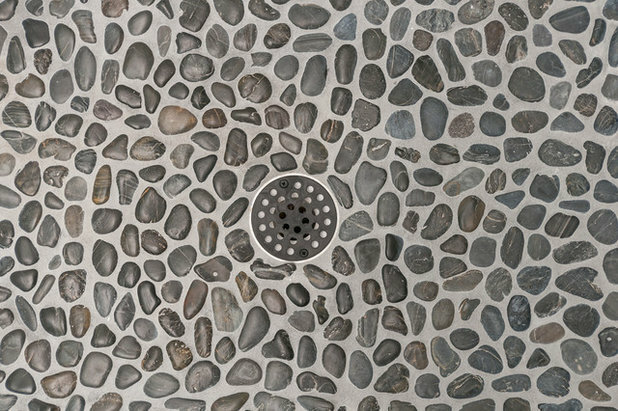 What I learned: Although I had a very dark charcoal, almost black, grout picked out for the shower floor, the tiling crew made me realize that the pebbles were not black and that the grout I had chosen would look bad. What else I learned: Some details don’t matter that much — let some things go. I had ordered a very design-y black square shower drain that worked well with my shower fixtures, but I forgot to communicate that with the tile installers or enter it on the app. When I saw they had installed a round one, I realized that it worked better with the pebbles anyway. What I learned: Some details do matter. 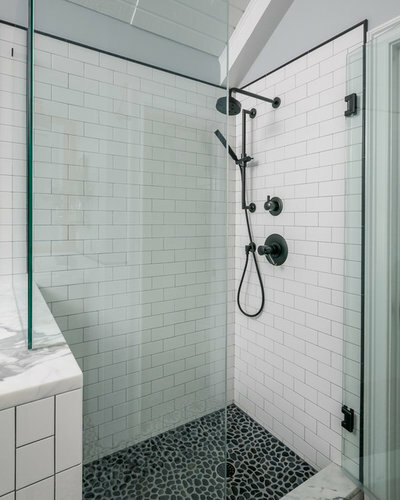 Because matte black is a relatively new finish, the glass company I used for the shower doors did not have many selections in it for handles and hinges. (Quite understandable, as there isn’t much demand for it yet.) 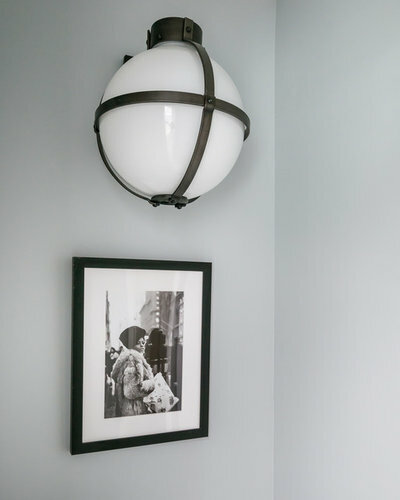 After I fell in love with the simple look of the handle called Ladder Pull, I found out that it would have to be special-ordered in matte black and would take months. But I simply could not have some froufy Victorian handle competing with the strong lines of the shower fixtures, and I did not want to choose a different finish. I’m glad I was patient. What else I learned: Sometimes when you think you’re being crafty and tracking down the exact Ladder Pull you want online, they accidentally send you a different item directly from China instead (it was a peephole). But they eventually straightened it out. 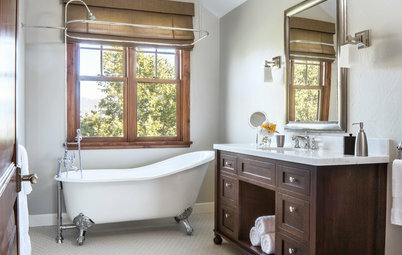 Tub faucet: Fortuitously, I happened to choose a tub faucet with cross handles rather than lever handles. The plumber let out a sigh of relief, as he’d forgotten to let me know that levers may not have turned all the way on in the tight space where they were placed; they would have hit the shower’s half wall. 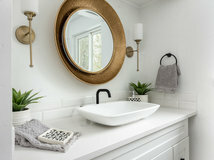 The faucet is unlacquered brass. I can’t wait until a patina starts to appear. I decided to go for a comfort-height toilet in the bathroom. This Memoirs model from Kohler has a really nice top on the tank with an edge that keeps things from falling off. What I learned: This paint color changes dramatically from day to night. It’s a light gray, but at noon, it has a very bluish look. At night, it’s a true gray. What I learned: Not many people can pull off looking fierce when hung over a toilet. But Diana Ross can. Somewhere down the line, I realized that I didn’t want to have all this work done only to have my reclaimed-wood counters eventually rot and ruin the whole thing. They had put in a good 15 years but had some damage around the faucets, and, sadly, it was time for them to go. I planned for some practical, durable quartz instead. What else I learned: If you have a waterfall countertop with a prominent veining pattern like mine, have the installer place the template pieces continuously on the stone slab. That way the veining pattern continues down and across, uninterrupted. Also, make absolutely sure that you are present to approve the templating on the slab and that you take a photo of it while you’re there. I worked on the countertops with Simona Tivadar at Custom Kitchen. 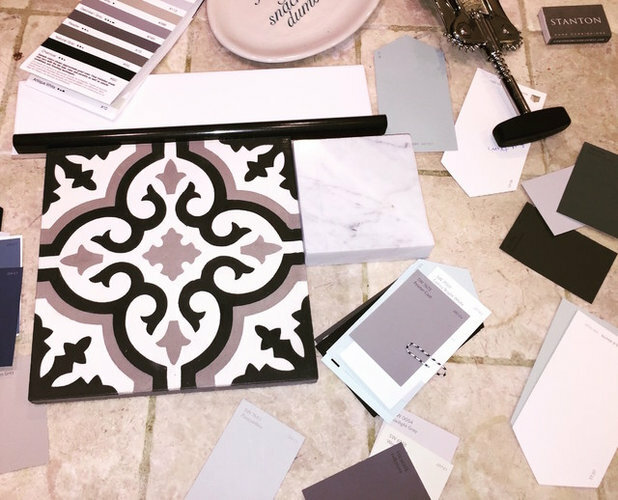 She has great taste, and with her keen eye, she also helped me figure out which backsplash tile was just the right white to complement the marble. The photo: I need to get that photo on the wall professionally matted and framed, but I didn’t have time before photo shoot day. It’s an iconic photo within my family of my giant dad in a tiny claw-foot tub giving the victory sign back in the ’60s. My uncle Tommy Calder took it back then. He tracked down the negative and had it blown up for me. Pewter Cast SW 7673 vanity paint: Sherwin-Williams; hardware and glass shelf: Anthropologie; Irvine double sconces: Schoolhouse Electric & Supply Co.
What I learned: Unless you have really detailed drawings from an interior designer of where every piece of tile will go and how it should be cut, you want to try to be around during tile installation. There are small design decisions that will come up on the fly. 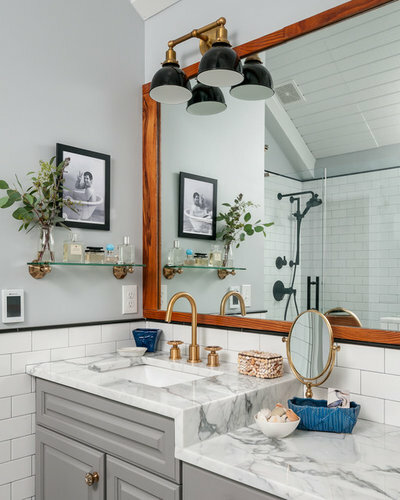 For example, I had pieces of marble cut for the shower threshold, the top of the half wall and the shower niche from the same slab as the countertops. I then had the tile installers put in a border of the same Absolute Black granite pencil-tile trim around the inside. 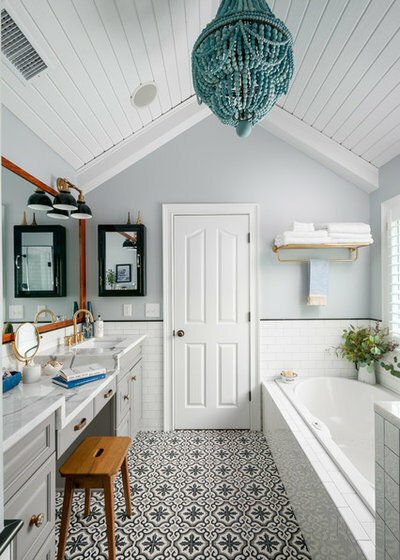 There are also funky things that will happen around corners and in tighter spaces where you may want to give your input on the pattern, even with something as simple as subway tile. What I already knew: I hoard. As was obvious from the “before” photos, I have a problem with countertop clutter. So I invested in a large medicine cabinet to hold everyday stuff. Also, the huge drawer clean-out I had to do on the vanities so that they could be removed and painted provided a ton of new storage space. I also knew that I was stretched for towel storage so I bought a train rack for them — no more towels shoved willy-nilly in a cabinet under the sink. 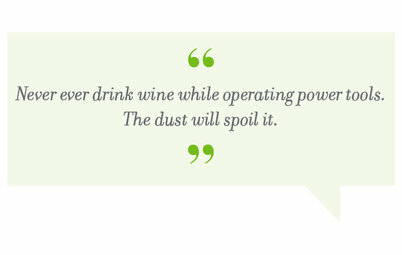 Make use of things or ditch them. I organized my shampoo, conditioner, lotion and face cream samples that were still usable in a hanging cosmetic bag. I hung it on the back of the door and vowed to use them every day. I haven’t had to buy a bottle of any of that stuff for several months now as I go through them all. Savings: I reused the original vanities, mirror and bathtub. The planks were already on the ceiling, and I already had great doors with hardware that worked well with the new finishes. 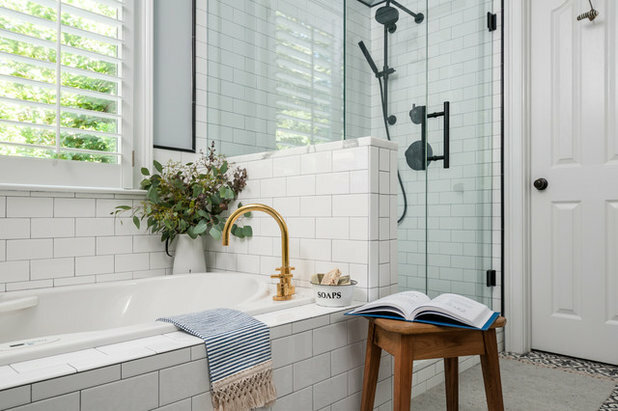 Although I think a freestanding tub would best suit this space, I love the very nice Jacuzzi bathtub that came with my house, and the thought of anything less comfortable gave me pause. Plus, tubs are expensive. What I learned: Keep your eye on the price of your back-ordered items. If you see that something has gone on sale while you are waiting for it to arrive, call the retailer. This renovation experience was so educational and a lot of fun. Some days, I even miss the plastic and all the activity. If you have any questions, please ask, and I’ll do my best to answer them. Hub 24" Mirror, Black, 37"
Really enjoyed following the renovation of your bath project. The before and after pictures were enlightening. 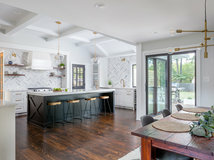 I'm sure it is a stretch but are you able to provide me with a short list of professional house renovation types in my area- Mobile, Al? I did a little research and sent your brother's company a similar request. I have had several contractors visit, several postpone, and several I cancelled with, after seeing their website/facebook illustrations of projects...For me, the reluctance of allowing someone I really don't know into my house to work while I am away is what is keeping me from choosing The Right Contractor. 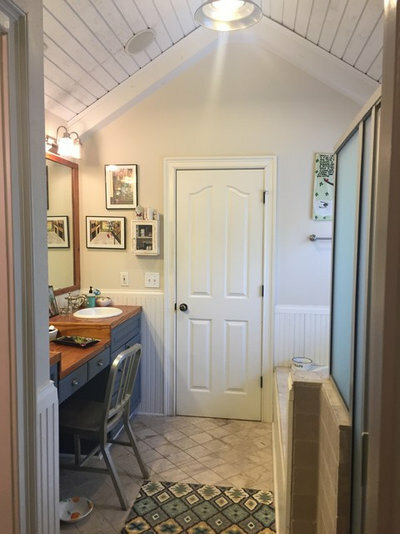 If I can merge estimate price and warm fuzzy I will have cleared the first hurdle to getting this master bath and master bedroom project off the ground. I need advice. Thanks. 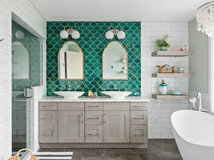 We recently finished our bath reno, and the total work time was about 3 weeks. 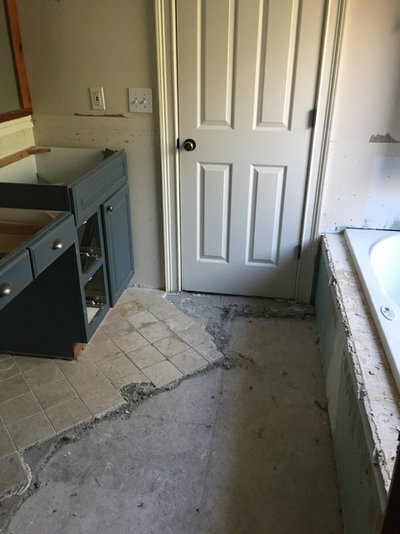 We were removing the tub and putting in a shower, and the only thing we kept was the floor, 1" square white tile in good shape. 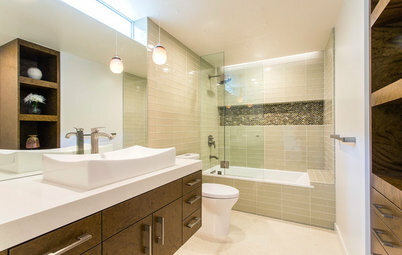 We opted for a high end prefab shower unit, in a white subway tile pattern. That was the biggest item in the budget. 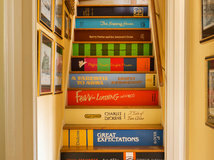 The rest was done by the contractor who had been doing other parts of the house over the last several years. The bath was the last and biggest project to be done. 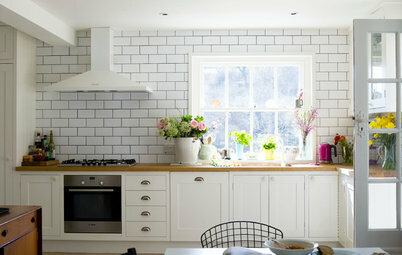 We decided to do white subway tiles like the original hundred year old tiles, only bright and new. I bought tile and toilet and vanity at a big home center and ordered other things online. I discovered that suppliers vary widely in their shipping times, and just because something is on a store's web site, that doesn't mean they actually have it in stock. 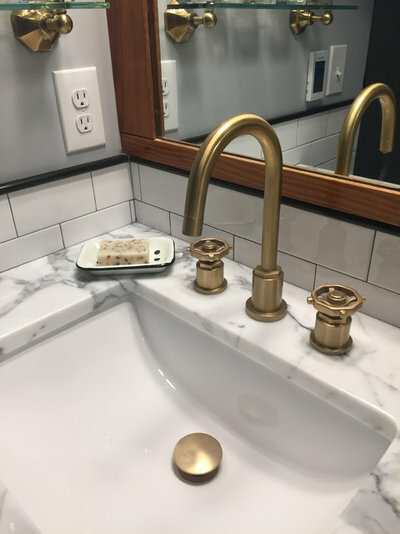 The most stressful point was being told while the wall tile was actually being put up that the brown marble accent strip I had spent so much time picking out was thicker than the subway tiles, and I had to go out RIGHT NOW and pick out new accent tiles. It was sheer luck that the third place I tried (halfway across town) had the perfect tile, glass that looked like brown tiger eye..
Now it's finished, and I do love it so. I simply bask every time I take a shower. It's white and bright and flooded with light. It's still very much a blank canvas, and we've decided to wait to hang art until we have a clear notion of what should go there. For now we're just appreciating it. One more thing, I found actual Targaryen dragon cabinet knobs, from Game of Thrones; just the right touch of nerdiness amid the classic white. Also, if you plan on using a designer or architect on your project, they will often have contractors that they will recommend. So you could start there and work backward. They'll likely have a good working relationship with whomever they recommend which will usually make the project go smoothly.